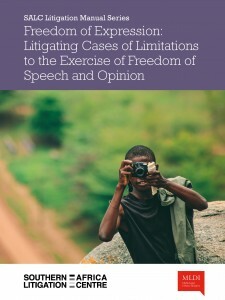 This manual is a resource for private and public lawyers in southern Africa who are litigating cases in domestic courts challenging laws, policies and practices involving freedom of expression. The manual discusses the use of foreign and international law in domestic litigation as well as providing an overview to the right to freedom of expression and the manner in which it can be limited. It has detailed sections on defamation, privacy, national security, contempt of court and hate speech which explore the way international and domestic courts have addressed issue of freedom of expression in these specific contexts. The manual was written jointly with the Media Legal Defence Initiative (MLDI). To download the full version of the manual, click here.